Transparency Market Research (TMR) has published a new report titled, “Life Science Reagents Market - Global Industry Analysis, Size, Share, Growth, Trends, and Forecast, 2018–2026”. According to the report, the global life science reagents market was valued at US$ 35.0 Bn in 2017 and is projected to expand at a CAGR of 7.0% from 2018 to 2026. The report suggests that technological advancements in the health care and life science industries, high prevalence of chronic and infectious diseases, and rapidly aging population across the world are anticipated to drive the global life science reagents market in the next few years. North America and Europe are projected to dominate the global life science reagents market during the forecast period primarily due to rapidly aging population, well-established health care infrastructure, and presence of a large number of pharmaceutical, biotechnology, and diagnostic companies. The life science reagents market in Asia Pacific is projected to expand at the highest CAGR from 2018 to 2026. This is attributed to rapidly improving health care infrastructure and increased foreign direct investment in the health care and biotechnology industries in emerging countries such as China, India, South Korea, and Malaysia, and increased per capita health care expenditure in the region. Life science reagents are an integral part of any clinical diagnostic laboratory and pharmaceutical & biotechnology industry. Technological advancements in molecular biology, life sciences, and biotechnology has brought about drastic changes in various fields such as medical diagnostics, drug discovery, personalized medicines, forensic sciences, and clinical research & development. Development in the areas of immunoassay technologies such as enzyme linked immune assay technology (ELISA), chemiluminescent immunosorbent assay (CLIA), and next generation sequencing (NGS) techniques are projected drive demand for immunoassay reagents during the forecast period. Moreover, molecular diagnostic techniques such as digital PCR, rtPCR, FISH, chromatography techniques, and flow cytometry techniques have witness high demand in the life science reagents market. Technological advancements in cell and tissue culture have accelerated adoption of life science reagents in the areas of microbiology, antibiotics, and diagnostic testing. Clinical research organizations, diagnostic laboratories, and biotechnology players are engaged in the development of new diagnostic tests to address the unmet needs in the health care industry. Moreover, major manufacturers operating in the market are involved in continuous research & development activities to expand their product portfolio. In October 2017, the U.S. FDA approved Roche diagnostics’ cobas Zika test for use on cobas 6800/8800 systems. The cobas Zika test is the first and only available commercial test for the detection of Zika virus RNA in samples of human plasma. Hence, technological advancements and new products launches in the health care and life science industries is projected to propel the global life science reagents market during the forecast period. The report offers detailed segmentation of the global life science reagents market based on product type. In terms of product type, the immunoassay reagents segment is poised to account for leading share of the global market during the forecast period from 2018 to 2026. Immunoassays are widely used to detect concentration of antibodies, enzymes, hormones, etc. based on its ability to act as an antibody or antigen in a chemical reaction. Wide applications of immunoassay reagents in the diagnosis of autoimmune disorders, cardiac disorders, fertility testing, diabetes testing, drugs of abuse testing, thyroid disorders, bone metabolism disorders, and inflammatory disorders have contributed to its leading share of the global market. Moreover, technological advancements in the immunoassay techniques such as chemiluminescence immunoassay (CLIA) technique and increasing adoption of CLIA technique in developed countries is projected to augment the segment during the forecast period. In terms of end-user, the hospitals & diagnostic laboratories segment is projected to dominate the global life science reagents market during the forecast period. The segment is anticipated to expand at a CAGR of 7.0% during the forecast period. Large number of clinical diagnostic tests are performed in hospital and diagnostic laboratories for diagnosis of a large number of diseases. Prominent share of hospitals and diagnostic laboratories is attributed to large base of hospitals and diagnostic laboratories across the globe. Moreover, rapidly increasing number of hospitals and diagnostic laboratories in emerging countries to expand geographic presence, expansion of laboratory services, and consolidation among health care institutions in developed countries is projected to drive the segment during the forecast period. The commercial & contract research manufacturers segment accounted for the second leading share of the global life science reagents market in 2017. High consumption of life science reagents in the pharmaceutical and biotechnology industry for the development of various types of assay, test kits & solutions, culture media in tissue culture industry, monoclonal antibodies, growth hormones, and biologic drugs are attributed to the second largest share of the segment. The life science reagents market in Asia Pacific is projected to expand at the fastest CAGR of 8.0% during the forecast period. Large population, presence of emerging economies such as China and India, large number of elderly individuals in Japan present significant opportunities for global players in these countries. Adoption of technologically advanced products in Japan, China, South Korea, Malaysia, and Singapore are likely fuel the growth of the life science reagents market in Asia Pacific. 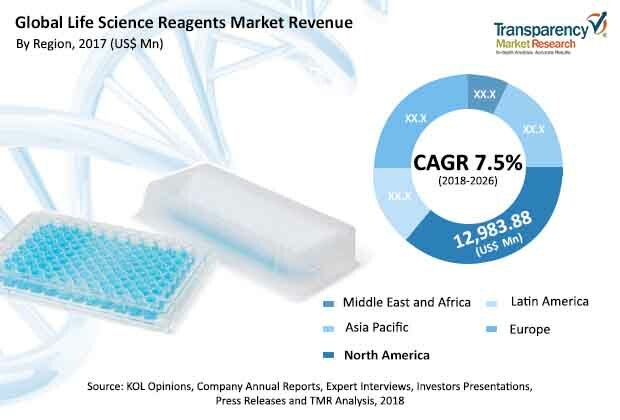 Moreover, increased investment by leading pharmaceutical and biotechnology companies in India and China, and rapidly increasing number of hospitals and diagnostic laboratories in the region boost the growth of the life science reagents market in the region. In September 2016, Abbott Laboratories established and inaugurated a new research and development facility in China, which would be focused on developing new diagnostic tools for patients in China. Key laboratory service providers are expanding operations in emerging markets. SRL Diagnostics expanded its base in Southeast Asia. Quest Diagnostics established its operations in India and other countries in Asia. The report also profiles the leading players operating in the global life science reagents market. F. Hoffmann-La Roche Ltd., Danaher Corporation, Abbott Laboratories, Siemens Healthineers, Thermo Fisher Scientific Inc., and Merck KGaA are the leading players operating in the global market. Majority of the companies are focused on mergers, acquisitions, and strategic collaborations with each other and research institutes to strengthen their product offerings in the market and for geographic expansion in emerging countries to tap unmet needs in the region. Since 2015, F. Hoffmann-La Roche Ltd. has made more than eight strategic acquisitions in molecular diagnostics, cell & tissue culture, and immunoassay diagnostic field. Around 30 to 35 mergers and acquisitions have taken place in the past three to four years among leading industry players. Other prominent players include Becton, Dickinson and Company, Agilent Technologies Inc., Waters Corporation, Ortho Clinical Diagnostics, bioMérieux SA, Sysmex Corporation, and DiaSorin S.p.A.